Alone in the Madness is an interesting action game. This game has simple graphics, suitable for those who like zombies. You can experience this game on your browser because it is a flash game. This is a violent game and is only for those over 18. In this game you will have to fight the zombies to survive in the dark rooms. Your enemies are hungry zombies, they will attack you and your mission is to destroy them. You have to look at the map and find the weapons to defend yourself. You can use the iron bar, dagger, gun ... to destroy the zombies. 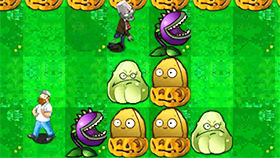 The challenge in this game is that you need to click as fast as you can on the zombie head (when the red zone appears). If you do not click on them, you will be attacked by zombies and you will lose.